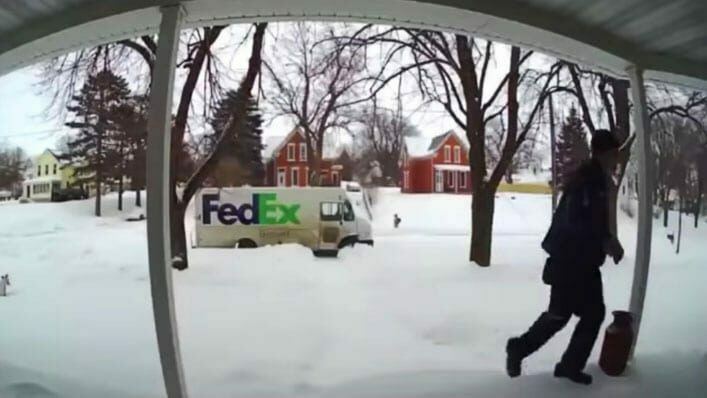 While porch cameras are typically busting package thieves and intruders, one front door security system recently caught a FedEx worker in the middle of a random act of kindness that has now gone viral. Leigh Anne, a newly widowed mother of three, was in a bind after a harsh snowstorm in her small Nebraska town. Leigh Anne was attempting to pump air in her tires but couldn’t remove the firmly secured cap. Frustrated and without a helping hand at home, she spotted a FedEx truck parked on the side of her street and asked if the driver would help her out. She soon realized that she recognized the driver, Brian, who she frequently sees delivering packages around her neighborhood. Though he was packed with a busy delivery schedule and backed up by the wintery weather, Brian was quick to stop what he was doing to assist Leigh Anne. As the two struck up a conversation, the driver learned of Leigh Anne’s heartbreaking loss. Only a few months ago, her husband had passed away after a seven-month cancer battle. He was only 42 years old. Before she could realize what hit her, Leigh Anne was a widow and single mother left to raise three young children alone. Brian was deeply touched by this struggling woman’s story and felt that he had to do more than simply twist off her tire cap. Expecting to go unnoticed, the compassionate driver decided to carefully shovel Leigh Anne’s entire porch and sidewalk, which were packed with snow from the storm. Little did Brian know, the widow’s doorbell camera caught the beautiful scene on camera, and his unsolicited act of kindness is now warming hearts across the web. “Doorbell cameras don’t only catch people stealing packages,” Leigh Anne wrote on Facebook.